Women Lawyers: Did You March? Did you march in the Women’s March last Saturday? What was your experience? Where will you take that experience? First a disclaimer. Due to an illness and a family emergency, I was not able to march and demonstrate my resolve for my most fervent cause — women helping and supporting women. I was deep in disappointment, but I was with all of you who did march, if only in spirit, as you knew I would be. I was spellbound by the TV images all day and evening. I particularly liked the aerial photos of the Chicago march and the breathtaking architecture of that city, and I also loved the photos of DC and NYC where I live and spend so much time, respectively. However, the images of marches in cities throughout the world were awe-inspiring. There is no arguing about the success of the marches. The sheer numbers were overwhelming, and the diversity of attendees and causes represented was uplifting. The solidarity demonstrated was palpable. I was particularly impressed by the presence of men in the crowds and their responses when asked about their participation — that they had not been invited to join the women in the past. 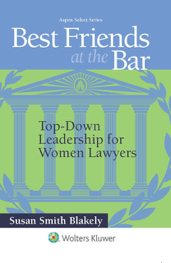 It reminded me of one of the themes of my book, Best Friends at the Bar: Top-Down Leadership for Women Lawyers (Wolters Kluwer/Aspen Publishers, 2015). We need to invite both men and women into the discussions about the inequities affecting women if we have any hope of finding effective and lasting solutions. The day was a powerful statement that has been years in the making since the suffragettes marched in support of voting rights for women in 1913 and the Million Woman March of 1997 in support of equality for black women. It was a day of protest, very successfully done, and it echoed around the globe. A strategy going forward — that is the key. It can be a group strategy or an individual strategy or both. Consider the options for a group strategy. What organization will you join to leverage your power to positively affect the future for women? There are so many to choose from. On the individual front, activist Michael Moore asked some pertinent questions from the speakers’ podium. Are you going to vote in the next local, state and national elections? Are you going to “walk the walk” in the true sense of the word by consider running for public office to let your voice be heard and to be in a position to affect future policies and legislation to improve the lives of women. Those are good questions, and I hope you have some good answers. We all need to think about it. So, bravo to all of you who marched or who wanted to march — and I most sincerely hope that I never have to sit out again. I hope we were heard. I hope our positions were respected as we spoke truth to power. I hope changes in laws and policies will follow. I hope we inspired a whole new generation of protesters and activists for just causes. That will determine the real success of the day. We all are — or we should be – thinking a lot about leadership these days. This is an important week as we witness the peaceful transfer of power from one national leader to another here in the United States of America. It is what distinguishes our democracy, and it should not be missed, even if your candidate is not being sworn in. I will be doing my part for the inauguration by participating in a leadership program that, every four years, brings college students to DC to witness the inauguration and hear from leaders in a variety of career areas. I will have the opportunity to speak to at least 200 collegians and talk with them in one-on-one settings to answer their questions about careers in the law. I am looking forward to contributing to this program, where a lot of the discussion will be about leadership and what makes an effective leader. So, what are the qualities that we should be looking for in a leader? 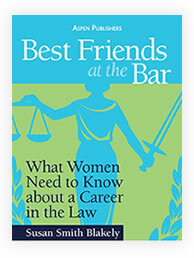 That is what I wrote about in my book, “Best Friends at the Bar: Top-Down Leadership for Women Lawyers”(Wolters Kluwer Law & Business and Aspen Publishers 2015), and it is a really important subject. 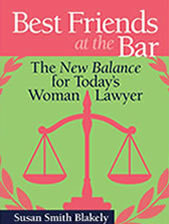 Although that book focused on law firm leaders, the concepts are easily transferable to leaders in other settings. The important leadership concepts that I discuss in that book came from one of the gurus of leadership, Marshall Goldsmith, who has been identified by such venerable institutions like the New York Times and the Harvard Business Review as one of the best leadership trainers in the world. After spending a weekend with him and almost fifty other “students” several years ago as part of my own leadership and coaching certification, I understood a lot about the difference between talking about leadership and walking the leadership path. Here is some of what I learned. Effective leaders focus on the needs of those they lead as much as they focus on their own personal needs. Leadership involves a lot of listening and less speech-making than you might think, which is not always so easy because we all love to talk about ourselves. By talking all the time, however, we miss getting new and fresh ideas from others. We also miss the opportunity to help others problem solve, and we pass up the opportunity to develop leaders for the future. Champions, praises, rewards and gives proper recognition for the achievement of others. Keep these things in mind as you watch the events of the rest of the week unfold. In addition to the inauguration itself, there is a lot to learn about effective leadership — or lack thereof — by watching the confirmation hearings for the president-elect’s cabinet-level appointments. We have a whole new set of “leaders” coming to town, and we hope they will be effective and deserving of their titles. How do you think they measure up so far? Thought For The Day from Dr. Martin Luther King, Jr.
One of the tenets of my Best Friends at the Bar program for women lawyers is “Be a discriminating listener, but do not listen for discrimination.” In other words, some things are not intended to be gender discrimination and are not harmful, and it is a waste of time to pursue them. It is better to save your thunder for the real thing that creates a disparate impact and is career damaging. Having said that, however, gender pay inequality is the kind of discrimination that is definitely a big deal, and it always deserves a second look. The examination of this problem needs to be thorough and discerning and involve a fair comparison of “apples to apples” to assure reliable results. In other words, the comparison of what women lawyers are paid and what male lawyers are paid must involve a very strong similarity of work performed and benefit to the law firm. The volume of articles that have appeared recently on the subject of gender pay equity and also lawsuits, which have been filed within the last year by women partners alleging gender pay inequity at their law firms, will be helpful in that analysis. 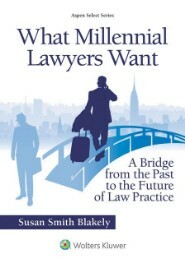 It is time for some real soul searching in law firms as they look to the future of the profession. Tolerating implicit gender bias and gender pay inequity will create adversity within the law firm ranks and increased competition among team members. It will discourage camaraderie and will undermine best practices. It also will have a negative effect on law firm succession plans as mid-level talented women lawyers leave because of unfair and unwise practices. There is a lot of well-researched information and recent developments, including pending law suits against law firms on allegations of unequal pay, between the introduction and the conclusions, and I urge you to read the entire article. You need to know about this issue, the history of equal pay in this country, and how you fit into the overall conversation. Take time to protect your future — and the futures of your female colleagues. Read and share!